I showed you this sign for Hyde Library in January 2014. It is now hanging off and has been for some weeks. In September I posted about the protest to "Save our Library". The council dismissed this protest as being politically motivated and claimed that library services were not being lost merely moved to another building (the Town Hall) ignoring the fact that the protest was not just about losing the service but about losing an historic building. 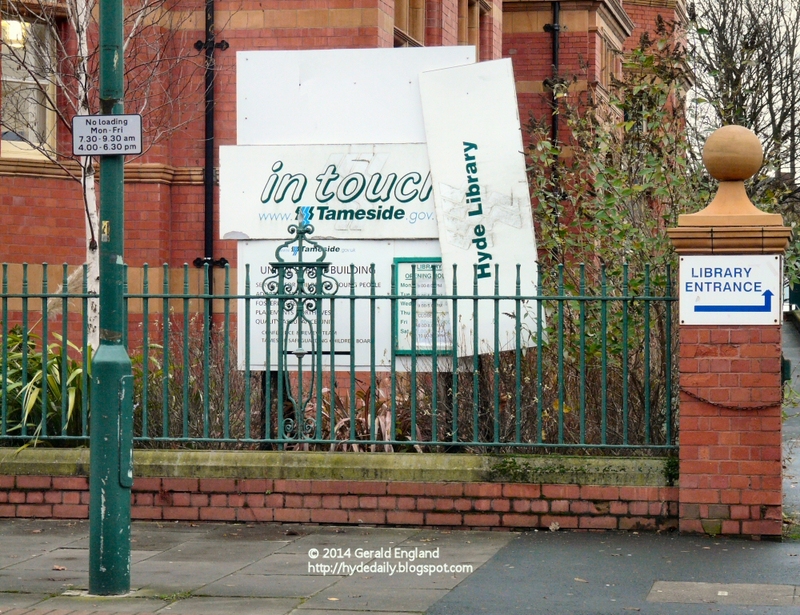 Tameside council have already closed Denton Library. Denton Library is to relocate to Denton Town Hall as part of a wider programme to reduce the number and costs of Council-owned buildings. Tameside Council's priority is to save services over buildings in its challenge to meet £142m Government funding cuts to its budget. Denton library is moving as part of this strategy and will in fact be going back to its original roots as the service started life in a room in the town hall in 1888. Now they plan to do the same in Hyde! Hyde Library was originally Hyde Technical School and Free Library. It opened in 1897 replacing the former Mechanics Institute. See the original plan for the building on Old Hyde. Please visit Best of Hyde Daily Photo 2014 and vote for your favourites. Deadline for voting is 12 noon GMT on Monday 29th December 2014. A contribution to signs, signs and Good Fences. a good fence but sounds like quite a battle to save the library. Removing libraries are one of the lynchpins in undermining a society. I imagine from the point of view of the local government, they probably don't have a choice- the funding isn't coming in from higher up, and certainly the current British government at Westminster doesn't give much of a damn about responsibility to society. What kind of people think closing libraries is progress? Everything is politically motivated, and to argue that to protest against the closure of a public library is politically motivated is to say that the closure IS politically motivated. The way to say it is certain circles these days is that "running a library is not a public task". Sheer nonsense. It is so sad to see libraries close. This is part of the growing anti-intellectualism sweeping the U.S. and Europe. No one trusts people who actually read books, so why fund their libraries? The loss of historic buildings, especially public buildings like this, is also sad.